I am a huge fan of Nicolas Roeg. His talent as an auteur is immeasurable, to this day his oeuvre of films are just as impactful, engaging and influential as they were on release. I have a particular obsession with his debut feature film (as co-director) Performance starring James Fox, Mick Jagger and Anita Pallenberg. I doubt there will ever be a similar type of film that could possibly outdo Performance, as with his stranded alien on Earth tale - The Man Who Fell to Earth starring David Bowie and his grief filled horror Don't Look Now starring Julie Christie and Donald Sutherland. These films were part of a movement that defined not only progressive British cinema of the time but Britain in the 70s. I say Performance was his debut feature film (as co-director) as Roeg was a in demand Cinematographer man before shifting to directing. Coincidentally the original Far from the Madding Crowd has just been restored and re-released by StudioCanal - which Roeg worked on as cinematographer & cameraman and features a scene with Roeg's hallmark camera and editing style which he became known for with his own features. The re-release of Far from the Madding Crowd is brilliant restoration starring some of Britain's finest talent making their mark including; Julie Christie, Peter Finch, Alan Bates and of course Terence Stamp but sadly lacks in decent extras, apart from a rather insightful chat with Terence Stamp who recollects the making of Far from the Madding Crowd. Nicolas Roeg's second feature as director, Walkabout is a beautifully shot tale of a young brother and sister played by Jenny Agutter & Roeg's own son, Luc Roeg and their local companion played by ubiquitous Australian performer David Gulpilil - has gone on to become the quintessential lost, coming of age, existential "road" man and nature film. 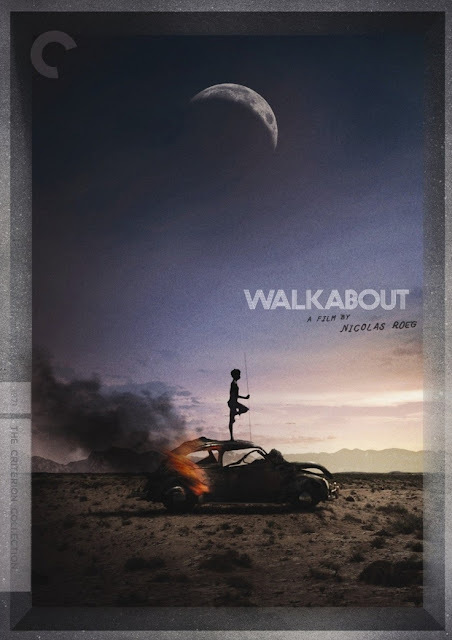 Which is why I'm stoked that Cinesthesia are bringing Nicolas Roeg's Walkabout back to the big screen for a special screening at the end of July with a Live Soundtrack from Orchestra Elastique. 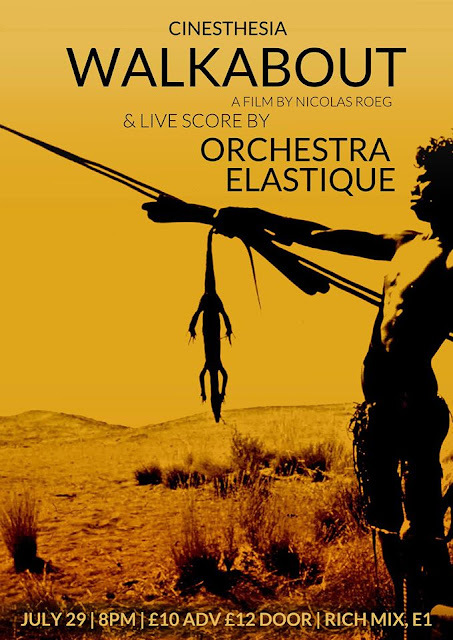 Listening to Orchestra Elastique's live version of John Barry's Walkabout score is worth the price of admission alone. A Two young siblings are stranded in the Australian Outback and are forced to cope on their own. They meet an Australian boy on "walkabout": a ritual separation from his tribe. Cinesthesia takes up residence this month in East-London's creative heart - RichMix, for a revision of Nicolas Roeg's classic film WALKABOUT with a live improvised score from the phenomenal Orchestra Elastique. Cinesthesia is a newly launched curatorial project bringing monumental films together with new live scores and expand the possibilities of the cinema experience. Orchestra Elastique are a London/Lisbon-based music improvisation collective, comprising of performers and multi-instrumentalists. Their ongoing motif is to face music as a playground. The result is a form of music that takes influences from Minimalist Music, Free Jazz, Middle Eastern, South American, Krautrock, and various folkloric and tribal traditions. Ranging from subtle dreams to explosive psychedelia, Orchestra Elastique’s performances elasticate mind, senses and spacetime. Two young siblings are stranded in the Australian Outback after being abandoned by their father. Forced to cope on their own, they are saved by a chance encounter with an Aborigine boy who shows them how to survive, and in the process underscores the disharmony between nature and modern life.